First of all I want to wish all of you reading this post a happy New Year! You might have spent a lot of time at the table and shared some good moments with the ones you love. At least that’s how we spent our past days. But it’s not over. I’m sure more dinners are to come the following weeks to celebrate the New Year. This quails recipe might be the one to impress your guests. Those just looking for a trendy recipe might want to skip to the bottom. Those interested in the future plans for this blog and some context might be interested in our past weeks. It started with spending some quality time with my sons and wife. We chose to end the year in a healthy way, walking, sporting… Due to health reasons we’re looking for meals that are light on the stomach and give enough energy to practice these sports. Therefore my wife bought “Het sportkookboek” (“The Sports cookbook) as a gift to herself. I have to admit I was a bit sceptic at first… Being not much of a health freak at all. Then again I’ll be the first to tell that I was wrong. After a week of delicious meals prepared by my wife. I have to say healthy and tasteful do go along. Moreover most of these recipes are easily adaptable to prepare on the BBQ. I don’t need to tell they’re even better this way I suppose? Yet I’m still stuck with a ton of awesome things on my bucketlist. Since I’m not good at giving things up, you don’t need to be afraid. Traditional recipes will still come online once in a while. Besides a lot of them aren’t even bad at all. This quail recipe for instance fits pretty well if you ask me. No use of butter and still a delicious result. 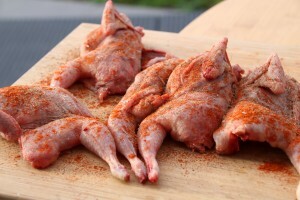 The only thing that might fight with the stomach is the addition of smoked paprika to the quails. And we both agreed it wasn’t even necesarry. So next time we’ll drop this and just season the quails with pepper. I got this recipe out of the book “Het lekkere buitenleven” by former world champion BBQ Peter Declercq. As far as I know his books are only available in dutch. I own some of his books and have to say they all come with good recipes. Only disadvantage in the books are the excessive use of product placement in his books. This quail recipe has been on my bucketlist as long as I own my Himalayan Saltrock. I used the stone many times before but I always used it to cook some fish. Some people wonder if you actually taste the salt. I have to admit I’m doubtful. In fish recipes I’m convinced you taste the salt. In this recipe I think the salt taste is not strong enough. We both added some salt afterwards. But it’s really fun to cook on! Once the stone is hot it’s really helpful to get a tasteful skin. 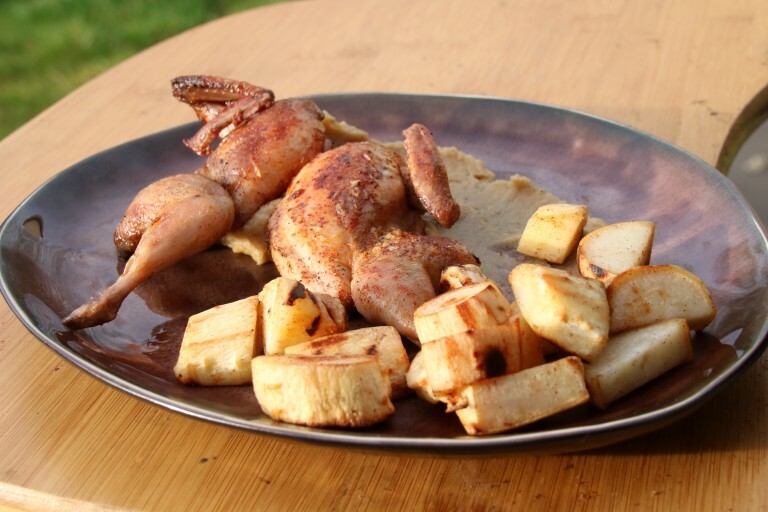 We ate these quails with Roasted Parsnip Puree (Recipe follows) and baked Parsnip and Parsley root. A really delicious meal if you ask me! It’s verry easy to prepare yet impressive in taste and has some show cooking attitude. Unfortunately my son quickly found out the quail thighs were heavenly… Being good parents we shared ours with a painful heart. The filets were juicy and tasteful too (two might have been a bit too far). But once again… Those thighs… Still drooling. 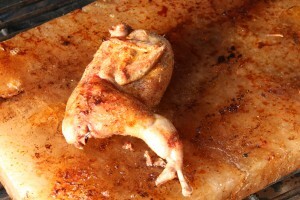 Delicious recipe for quails made on a himalayan saltrock. If you're searching for a saltrock take a look over here at the amazon store. Make sure you gradually heat the stone to prevent it from bursting. Unless you want two little ones. Prepare your BBQ for indirect cooking two hours before you want to prepare your meal. Aim for a heat of 100°C (210°F) to start with. Put in the saltrock and gradually rais the temperature to 220°C (430°F). This way the saltstone can adapt to the temperature and won't break. 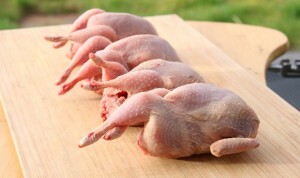 While the saltrock is getting temperature, you've got some time to divide and clean the quails. Spice them with freshly ground pepper and smoked paprika (if desired, we don't think it's needed). 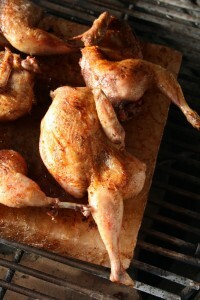 Place the quails on the saltrock skin side up for about 5 minutes. 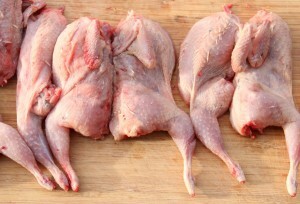 Turn the quails skin side down for another 3 minutes. 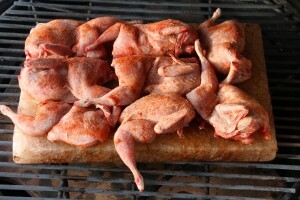 Remove the quails from the saltrock and let them rest for a few minutes. Add some additional salt if needed.